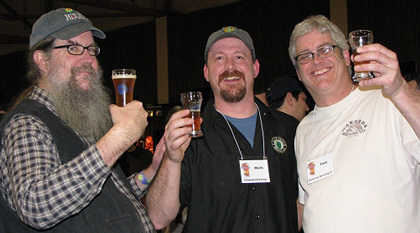 Last weekend, little old Eugene, Oregon enjoyed a bit of a mid-winter thaw with a cozy gathering of the beer community at the Lane County Fairgrounds for the annual KLCC Brew Fest. 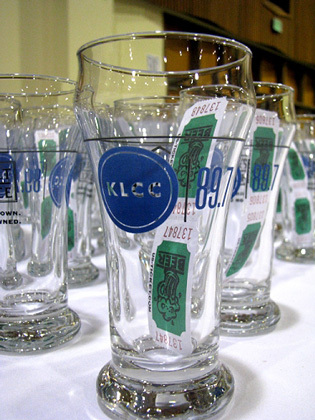 KLCC, our local public radio station, took over the festival in 2001, and it has since grown into one of their largest annual fund raising efforts with attendance approaching 5000 and almost 60 breweries pouring over 100 beers. Strains of bluegrass music, my favorite kind of drinking music, drifted out the double doors, taunting me, as I waited my turn in line. I did a double take as I was handed my commemorative sample glass and two drink tickets. Two tickets? Oh no, this will never do, I immediately purchased another dozen tickets. That’s a good starting point. The best thing about having a radio station put on a beer festival is the quality of music they provide. The music I was enjoying, the Ashleigh Flynn Band, and the next day’s band, The Essentials, are great and their music adds a lot to the festival experience. Personal tradition dictates I try the collaboration ales before venturing out to find new beers to add to my list. This year’s collaboration recipe was Sasquatch Strong Ale. Beer enthusiasts from the Northwest are familiar with the brewer Glen Falconer whose nickname was Sasquatch. 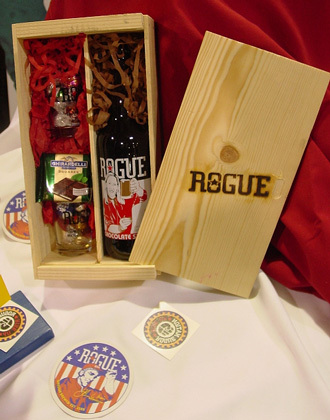 Glen’s reign as brewmaster at Eugene’s Wild Duck Brewery produced a popular list of creative beers that were elevated to legendary status with his tragic death in 2002 followed a few years later by the demise of the Wild Duck Brewery. Since Glen’s passing, a foundation was created in his name to help aspiring brewers with a scholarship fund that designates two worthy candidates each year and provides them an opportunity for a brewing science education from the Siebel Institute of Technology. 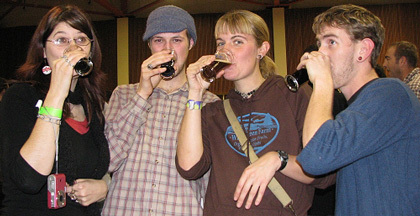 One of Glen’s most popular creations was Sasquatch Strong Ale. This year each of Eugene’s breweries created their own version of Sasquatch. Tracktown Sasquatch: (Eugene City Brewery, Rogue) Good chestnut color, a sweet brown sugar nose. Excellent hops to malt balance. I could drink this on a regular basis. Not as powerful and in-your-face as the original. Oakshire Sasquatch: Good color and head. A bit more hops in the nose and the mouth compared to the Tracktown, but still very drinkable. Ninkasi Imperial Sasquatch: Of course Jamie HAD to make an Imperial. Beautiful dark appearance topped by a wonderful soapy tan head. As with many of Ninkasi’s beers, it was a hop heads delight and a bit of a face-tweaker for me, very bitter. Probably the closest to what I remember my first taste of Sasquatch Strong Ale at Wild duck was like. Steelhead Sasquatch: I haven’t had a chance to try many of Brewer Ted Fagan’s beers so this was his chance to impress me, nice job Ted. Dark amber pour with excellent head retention. Good balance with plenty of floral hop notes. Nice clean finish. Guess I need to make a trip over the Steelhead and try more of Ted’s work. High Street Sasquatch: Something bad happened here…nuff said. Results: Ninkasi Sasquatch was most like the original Wild Duck Sasquatch Strong Ale, but I could drink more of the other three. Back to the brewery High Street. All right, now that I’d gotten that out of the way it was time to work the list and see what’s new and wonderful in the world of the KLCC beer list. Most of the beers were standards I’d had many times (the curse of being around beer all the time) but I did find some new brews to try and a couple new favorites for my repeat sheet. I’m not going to try and give you tasting notes on every beer. That’s hard for me and boring for you. Taste is so subjective anyway. Here are a few notes on some interesting new brews and brewers I found at the fest. Cumbrian Moor (Brewers Union Local 180): This was the only station pulling cask conditioned ale using beer engines and the new style plastic kegs. This was my first taste of Brewers Union Local 180. They opened in August 2008 45 miles outside of Eugene in the little mountain community of Oakridge. I heard they’d had some trouble setting up and had to fabricate something on the spot to support the beer engines because the tables were too flimsy to mount to. I also heard Ted Sobel, the brewer, was in the cast of a local theater production in Oakridge the festival nights. So, word has it, he had to make the hour drive back to Oakridge each night, go onstage and die (that was his part), then rush back to Eugene for the festival. That’s a Shakespearian level of dedication. All of Ted’s English-style ales are cask conditioned and the Cumbrian Moor was a dark brown, barely translucent pour, the beer was soft in the mouth and at the perfect temperature, I believe it was barrel-aged in a whiskey barrel but the notes seemed closer to sherry with a clean, dry finish. Very drinkable, I think I’ll have to run up the hill and sample some more of what Ted’s got brewing. 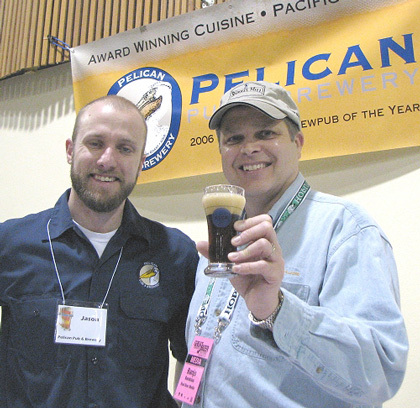 Le Pelican Brun (Pelican Brewery): Pelican brews seldom let me down and this beer was my favorite of the festival. Lots going on in this Belgian style ale. It pours deep reddish brown. A nice yeasty nose lets your tongue know something different is coming. A rich, slightly sour, combination of coffee and caramel malts with notes of burnt brown sugar and coriander fill your mouth and it ends with a lingering finish. Very nice! 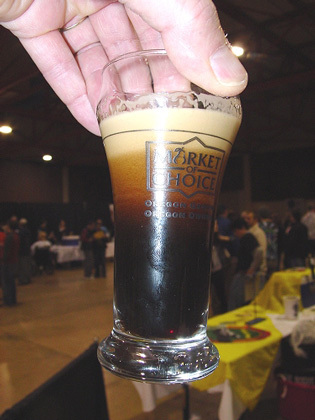 Overcast Espresso Stout (Oakshire Brewing): The pour is black and generates a nice brown head. The aroma is malt, molasses, caramel, and coffee with just a hint of hops. The taste is freshly ground coffee, malt, and maybe licorice. Kind of a dry finish, but excellent. Brown Eyes Brown (Silver Moon Brewery): I met Tyler Reichert, head brewer/owner of Silver Moon Brewing way back when he was all dreams and a little homebrew shop in Bend, Oregon. His attendance at the festival was due to a bit of last minute serendipity so he was pouring from an assortment of his new bottled brews he was delivering to the local Market of Choice. Brown Eyes Brown is an American Brown Ale. Since brown ales are my favorite I had to give it a try. The pour was deep chestnut in color. The taste was sweet molasses, malty and a little tart with a big hop finish. Interesting…Not your regular brown ale…I’ll have to try it again…soon. I didn’t sample everything by a long shot at KLCC. There were many other stellar beers, like Block 15’s Aboriginale, and Wakonda’s Black Elk Stout, etc, etc, etc, but I’m only allotted so much space for my ramblings. At 9pm the festival hall was getting a bit crowded and loud so we decided it was a good time to finish up. I rewarded my photographer, Bonne, with a glass of Young’s Double Chocolate Stout (delicious) followed by a sample of Rogue Chocolate Stout (excellent as usual). Then we cleansed our palettes with a couple pours of 21st Amendment Hell or High Watermelon Wheat (ahhhh, a perfect finish). I love my job. Next weekend, the Confluence Beer Festival on the Oregon Coast. See you there. To find the winners of the KLCC Festival’s Peoples Choice awards and Homebrew competition winners go to this link. More pictures from the KLCC event can be found here at the KLCC Beer Festival 2009 Flickr Gallery.